Railpictures.ca - Doug Page Photo: 1969 was the last full year that the overnight train operated between Toronto and New York City. 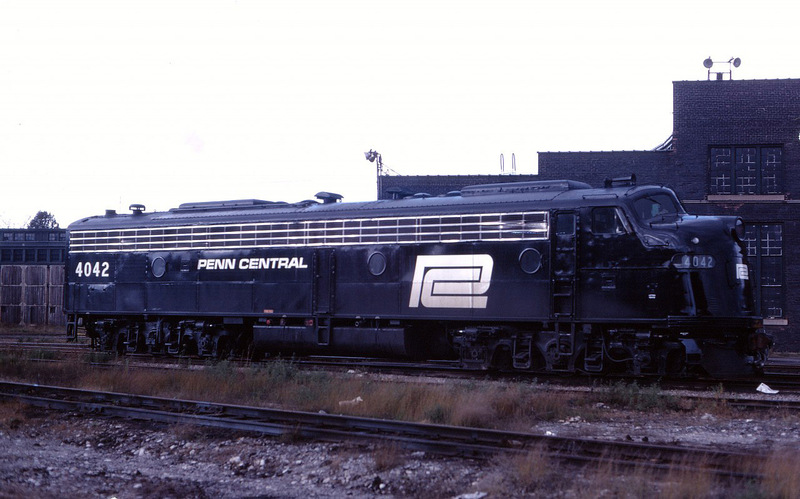 Normal procedure was for a CP locomotive to handle the train between Toronto and Hamilton with a New York Central/Penn Central (or TH&B) unit handling the train between Hamilton and Buffalo. The CP engine would stay in Hamilton overnight while the American unit would lay over at the TH&B’s Chatham Street roundhouse during the day. It has been less than a year since the NYC-PC merger and this morning we find former NYC E8A 4042 in PC black awaiting its nocturnal run back to Buffalo. | Railpictures.ca – Canadian Railway Photography – photographie ferroviaire Canadienne. Caption: 1969 was the last full year that the overnight train operated between Toronto and New York City. Normal procedure was for a CP locomotive to handle the train between Toronto and Hamilton with a New York Central/Penn Central (or TH&B) unit handling the train between Hamilton and Buffalo. The CP engine would stay in Hamilton overnight while the American unit would lay over at the TH&B's Chatham Street roundhouse during the day. It has been less than a year since the NYC-PC merger and this morning we find former NYC E8A 4042 in PC black awaiting its nocturnal run back to Buffalo.